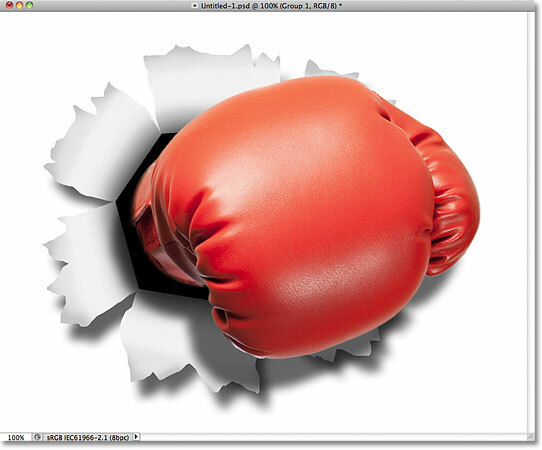 In this Photoshop Effects tutorial, we'll learn how to create a popular "punch through image" effect, often seen in sports and movie advertising (and weekly store flyers announcing their "incredible knock out prices! 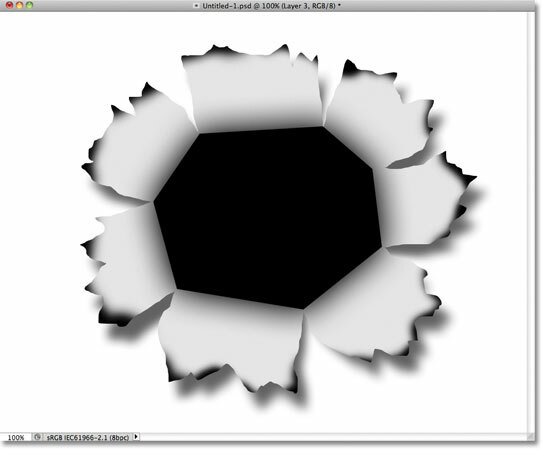 "), as if a person or object has punched a hole right through the page or image. There's quite a few steps involved in the tutorial, but as usual, they're all very simple. As we make our way through it, we'll cover some interesting techniques like converting layer styles to actual layers so we can apply filters to them, moving drop shadows around just by dragging them, and using layer groups to move multiple layers at once! I'll be using Photoshop CS5 here but any recent version of Photoshop will work. 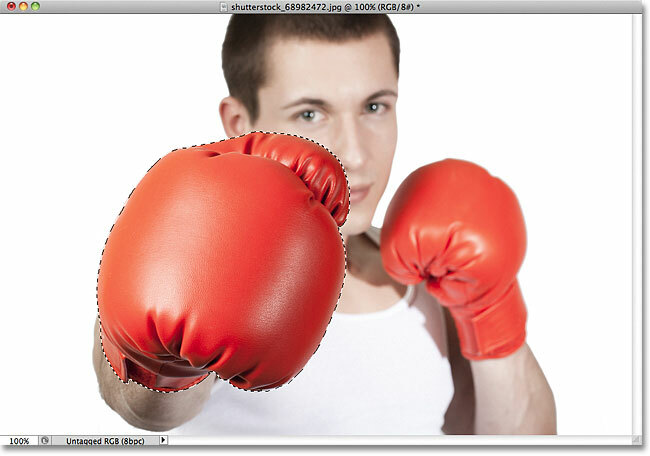 Photoshop adds a new blank layer above the Background layer. Click and hold on the Lasso Tool, then select the Polygonal Lasso Tool from the fly-out menu. Draw a polygonal-shaped selection in the center of the document. The selection has been filled with black. Layer 2 appears below Layer 1. Click and hold on the Polygonal Lasso Tool and select the Lasso Tool from the menu. 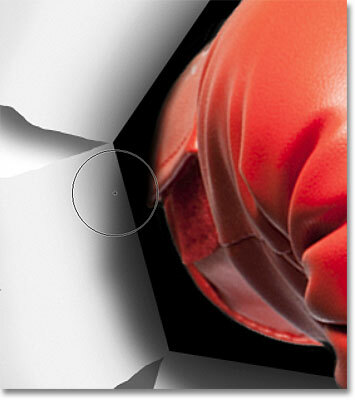 Make sure the width of your torn paper shape extends from one corner of the side to the other. Hold down your Shift key and draw the second shape. All torn paper shapes are now part of the same selection. Set the Use option to Color. 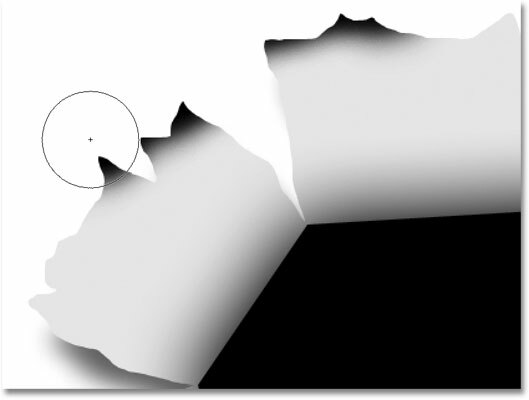 The image after filling the torn paper shapes with gray. Click on Layer 1 to select it. Select Outer Glow from the list. 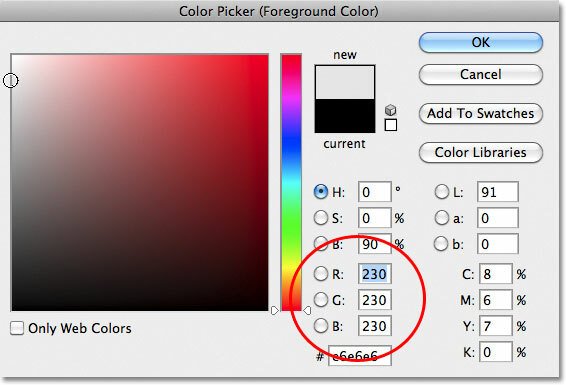 Change the blend mode to Multiply and the color to black. Increase the Size of the shadow, then lower the Opacity. The effect after applying the outer shadow. Right-click (Win) / Control-click (Mac) on the layer effects symbol. Choose Create Layer from the menu. The Outer Glow layer style is now a separate layer. 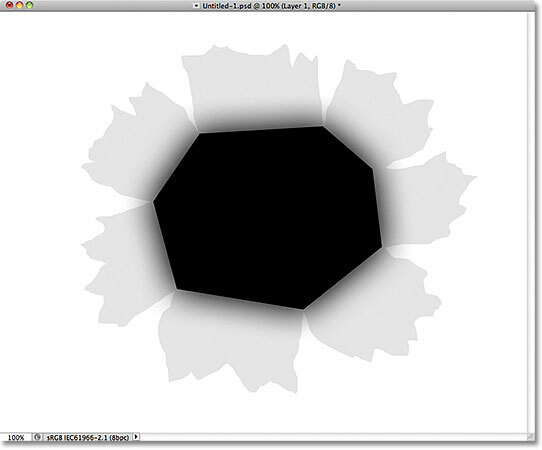 The outer glow layer is now "clipped" to Layer 2 and no longer affects any other layers. The shadow is now "clipped" to the torn paper. Click on the Layer Styles icon and choose Drop Shadow. The drop shadow appears behind the torn paper. Right-click (Win) / Control-click (Mac) on the layer effects symbol on Layer 2. Click OK to close out of the warning box if Photoshop displays it. The drop shadow is now on its own layer. Select the drop shadow layer. Draw a rectangular selection around the drop shadow. Go to Filter > Distort > Pinch. The Pinch filter dialog box. The drop shadow after running the Pinch filter. Lower the layer opacity to lighten the shadow. The shadow now appears less intense. The new layer is automatically clipped to Layer 2 below it. The Foreground (top left) and Background (bottom right) color swatches. Then, with the Brush Tool selected and black as the Foreground color, use a small to medium size, soft-edge brush to paint along some of the outer edges of the torn paper, which will again help create an illusion of depth. You can press the left bracket key ( [ ) on your keyboard to make the brush smaller or the right bracket key ( ] ) to make it larger. Hold Shift and press the left bracket key a few times to make the brush edges softer, or hold Shift and press the right bracket key to make them harder. Keep the center of the brush outside the paper pieces as you paint along their outer edges. The image after painting the outer edges of the paper black. The image after lowering the layer opacity. Click the New Layer icon to add a new layer above Layer 3. Paint with white through the center of each piece of paper to add a highlight. Lower the layer opacity to around 50%. The main "torn paper" part of the effect is done. Eye of the tiger? Maybe not, but good enough for our effect. Select the object that will punch through the image. 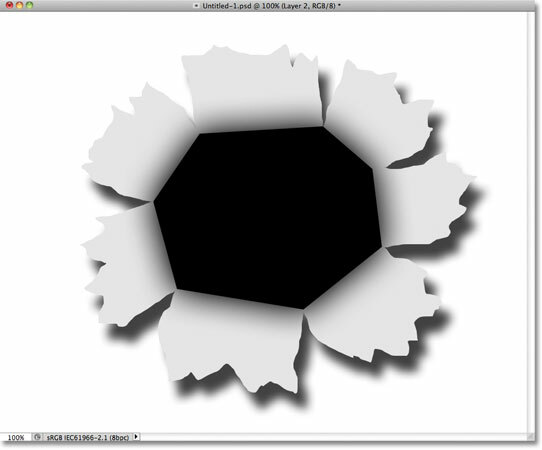 The pasted object appears on its own layer above the other layers. 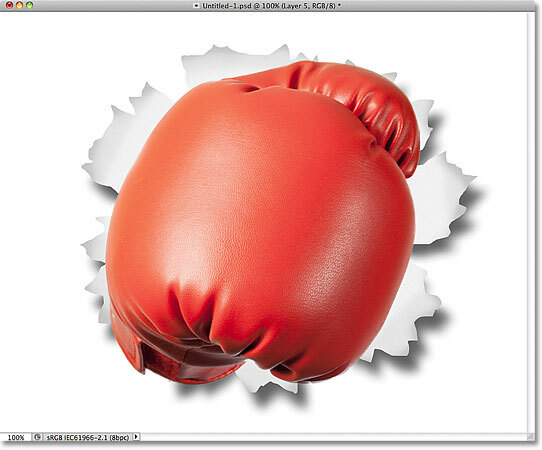 The boxing glove appears centered in the document in front of the torn paper. 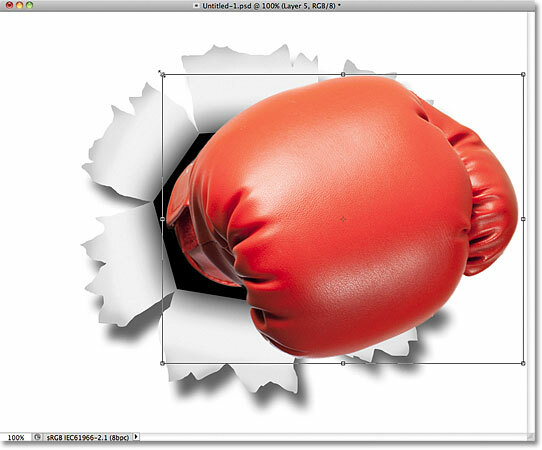 Use Free Transform to resize, move and / or rotate the object as needed. Click and drag the drop shadow around with your mouse to move it into place. Lower the drop shadow's opacity value. The image after lowering the opacity of the boxing glove shadow. A white-filled layer mask thumbnail appears. Painting with black on a layer mask hides the area from view. Select all of the effect's layers at once. Clicking the triangle to the left of the folder icon will twirl the group open or closed to show or hide the layers. Use the Move Tool to reposition the entire effect as needed. And there we have it! 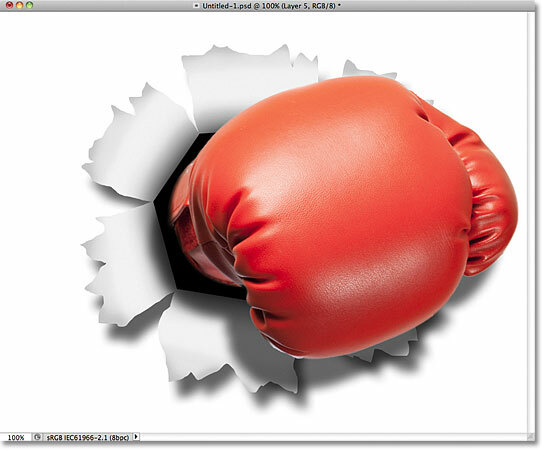 That's how to create a "punch through" image effect with Photoshop! Visit our Photo Effects section for more Photoshop effects tutorials!